For the past year, everyone seems to have been talking about the hiking cycle in the US. When will it start? What will happen to asset prices as interest rates normalise? The US dollar has been hoarded by hedge funds in anticipation of the demand for a higher yielding currency. The Federal Reserve dot chart predicts interest rates to hit 3% in 2017. And yet, much as I am loth to go against the wisdom of so many intelligent minds in the market and the Fed, I would place a £1 bet with anyone that we reach QE4 before we reach 3% short term US dollar interest rates. The reason that I say this is that, as discussed in previous posts, I believe that there is a demand gap. That is to say that for every $1 spent in the economy in time period t, only 99c is spent in period t+1. This means that structurally our economy over-saves. The reasons are discussed here (among other places on my blog). It is largely to do with interest and dividend payments making up too large a proportion of our GDP and the lower marginal propensity to consume of the receivers. Why am I so confident of this? 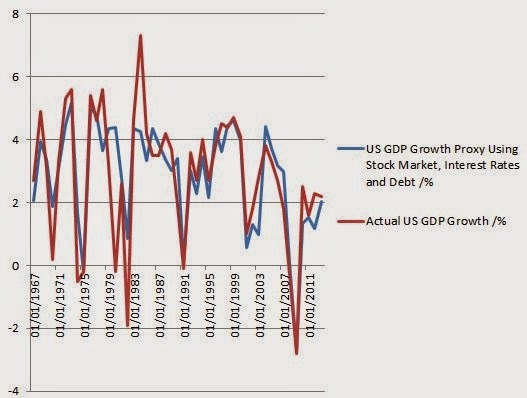 Because, in the US since 1965, in order to have the economy running at capacity we have needed an average of 8.5% of GDP per year of private sector debt to be added to the economy to keep demand up. We have needed an average of 2.7% of GDP government deficit per annum (and the trend is rising). We have had a stock market rising at 7.5% per year to increase wealth and spending. And recently those rises have been caused more by monetary policy than by expectation of economic growth. All of these have been necessary to keep growth at capacity. Had they not been there then demand would have been lower. There must be a demand gap because all of this was needed in the past. And most of it is unsustainable. As the private debt rises (as I discuss here) so does the demand gap. The amount of money needed to keep the economy growing gets larger and larger. At the moment we can see broadly trend growth in the US. We have a Federal deficit of 2.8%, we have asset prices at record highs making people feel wealthier and thus spending more, and we have monetary policy as accommodative as possible to stimulate even more private sector debt. Whilst an economy is an extremely complex system, in many ways it can be simplified to say that if there is enough money spent, then the economy can run at capacity. If too much is spent we will get inflation. If too little is spent then growth will be lower than capacity. In this way, GDP can be estimated using some other very basic data. Below, using regression, I build a proxy for GDP growth. This proxy is based on only the following: 1) change in short term interest rate during the year, 2) change in stock market the year before, 3) total private debt at the start of the year, and 4) change in private debt during the year. Here, the share price movement the year before and interest rate changes are an indicator of sentiment. The change in debt gives a boost to/drag on the economic growth, and the size of private sector debt gives a measure of the drag on the economy caused by the structural over-saving discussed above. The share price movement in the previous year also creates a wealth effect which stimulates spending of savings. Although this test is just for the US (and covers a larger time period), I find a similar effect of stimulus and drag from private sector debt as I do here. In this regression, the stimulus is 15% of the increase in private sector debt and the drag is 1.9% per year. This compares to my previous findings across 28 countries since 1995 of 11% stimulus and 1.5% drag. So, why do I think that we will have QE again? Because, at the current levels of private sector debt then, without help from rising asset prices or increased private sector debt, trend growth is at 0.65% per year. I just don't believe that enough private sector debt can be stimulated at considerably higher interest rates than we are seeing now, given the low expectations of future growth. For this reason I am happy to make the small bet that we will have QE4 before we hit 3% Fed Funds rate. I may be wrong about this; the capacity of private sector debt to grow can be surprising. But if it does, the pain at the end will be larger. 3) print more Central Bank money. Note that I do not mean QE here; I mean printing money that is put into the real economy rather than swapped for existing monetary instruments. 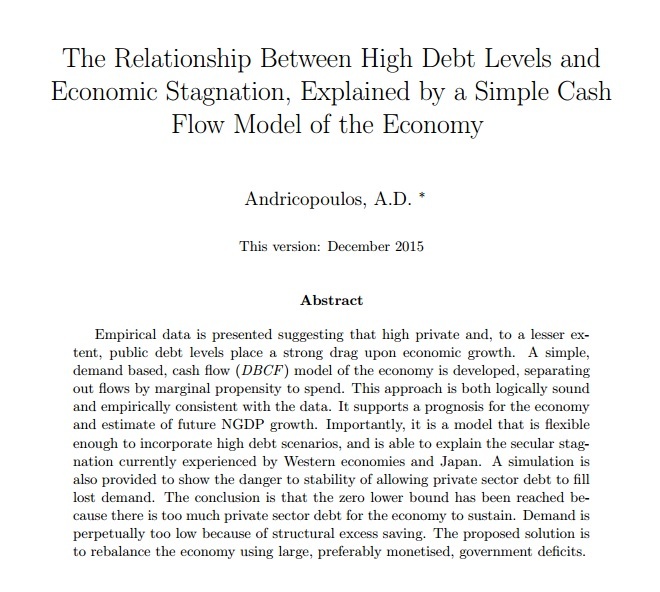 Since (3) is, unfortunately, viewed as heresy by the mainstream economics community we are left with only the choice of more debt. This can not go on forever. The other, indirect method, is through increasing asset prices, increasing wealth and thus increasing spending of existing savings. In the regression above, a 20% rise in the S&P creates a wealth effect (or helps predict GDP - it is not clear which) corresponding to 1.2% GDP growth in the next year. Eventually the Fed's powers to raise equity prices will stop. This also can not go on forever. The Fed is reaching the limits of its powers. Once the long term bond yields hit close to zero there is nothing more it can do to stimulate asset prices or private sector lending. The only way within the current framework would be if a rational government decided to use the Fed buying of government debt as a free pass to spend the necessary money (which is effectively method (3) above). Unfortunately government debt is not always seen rationally. In any case, if we do hit that debt ceiling I feel that we are really in trouble. As mentioned in every previous post, the only conclusion I can draw from all of this is that in order to achieve sustainable future demand, the Central bank needs to print money and give it to the government. This is the only way to regulate money supply that sustainably keeps demand high enough for the economy to run at capacity. On top of this, it counters the instability as well as the inequality and rent-seeking caused by ever-rising private sector debt. I agree with you that QE4 ( and 5 , to infinity? ) is almost inevitable , but it also wouldn't surprise me if the Fed went ahead first with their tightening exercise before reversing course. This might even have benefits that offset some of the certain damage , e.g. , it might serve to finally convince the non-believers that demand-deficiency is the order of the day. I think you miss one obvious solution in your list , but , noting your day job , I can understand why. Reversing , even partially , the increase in income and wealth inequality may be all that's required to restore a sustainable level of demand. The large debt overhang means that the response wouldn't be immediate , but it would strengthen as that burden was worked down. One deficit- and debt-neutral way to speed up the recovery while new policies work against the income inequality angle : Use accumulated excess private wealth to fund govt spending. Consider this : private net worth/gdp was ~ 3.3-3.5 for decades before it started rising sharply , and now sits at around 4.5. That's a whole year's worth of gdp that you could argue is fair game as a resource to be used in restoring the economy to sustainable growth. That's 20 years at 5% of current gdp in stimulus potential, not that anything nearly that extreme would be required. If the expropriation focused only on the very rich , the lost consumption via wealth effects would be at most a few cents on the dollar , whereas the gdp gain from govt spending could be very nearly 100 cents per dollar. Is it possible politically ? Probably not , as long as politics is in the back pockets of the rich , but sooner or later something has to give. Maybe Bernie Sanders will be the next FDR. Ha! Don't think that my day job precludes me from agreeing with you about redistribution. In fact I do agree. I have notes for a post where I look at ways to fix the problem without printing money - including removing the tax deductibility of interest, wealth taxes, property taxes on high value properties and other ways to increase spending without disincentivising work. However the problem here is practical. My back of the napkin calculations would suggest that, assuming money is spent through the relatively high multiplier of government spending, we need a minimum of 5% more government spending per year without further taxation. Assuming a 50% difference between the government multiplier and the rich persons MPC, this means that we need to raise 10% of GDP in extra taxes. in the US, the top 1%, who have the lowest propensity to spend, receive around 20% of the pre-tax income. They already pay tax. So in order to get the money from the rich it would take a tax rate of maybe 75%. This may not be practical to implement in this mobile world. Certainly in no country other than the USA. Ideally we would be able to tax corporations more, but then they would move their headquarters. A removal of the tax deductibility of interest payments (as suggested by the Economist this week) would raise a huge tax revenue and discourage borrowing. But the companies involved would just move jurisdictions to avoid it. Pension funds could be hit with a wealth tax. But this would be pretty unpopular. The easy thing about Central Bank money printing is that a) it is unavoidable by loopholes and b) no-one really realises the exctent that they are being taxed more. We clearly do need redistribution. Redistribution to encourage consumer spending and redistribution to reward work rather than rent-seeking. How we do it is a matter of what the most practical way to achieve this. removing the tax deductibility of interest, wealth taxes, property taxes on high value properties - out of all these I think property taxes would be the best. Hi Tim. It's good to hear from you again. In England we had a popstar making fun of the opposition leader for proposing a mansion tax. "You might as well tax this cup" she said, holding up her cup. She got some quite a lot of support. Everyone opposed always brings up an apocryphal granny in a £3m house who will be forced to move out. My point really is that all of these new taxes, whether sensible or not, face huge opposition. Which is a real shame, but maybe we have to look at other ways.